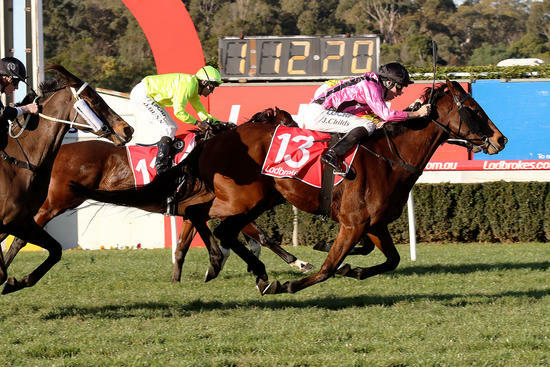 I Boogi stormed home first-up at Sandown on Wednesday to give Cameron Racing its first winner as the partnership of Russell and Scott Cameron. The four-year-old son of Iffraaj was first-up since March and started from the outside in the Clanbrooke Racing Handicap over 1200m. I Boogi was settled towards the rear by Jordan Childs, who waited until into the straight on the Lakeside course before bringing I Boogi out to make his run. Sweeping home wide out, I Boogi got up to grab Epic Moment close to the line and score by a half-head with another three-quarters of a length to Wall Street Wolf third. Scott Cameron said the track conditions played a major part in the win. "We've had him accepted with a few times now but just waited to find the right ground,” Scott said. The lightly raced I Boogi has won three of his 12 starts and placed in another five. "He's always shown us good ability. He's been a work in progress and it's great to see him reward all the hard work that has gone into him at home. We think he's more of a miler so it was good to see him do that today,” Cameron said. "To get my first winner in town is a good thrill, especially as it is in partnership with Dad who is such a great trainer. The stable came close to a metro double with The Thug running a close second in the previous race, the Ladbrokes Up For The Challenge Handicap over 2100m. “He tries hard and got a great ride from Luke Nolen so we are not unhappy with that.” Scott said.